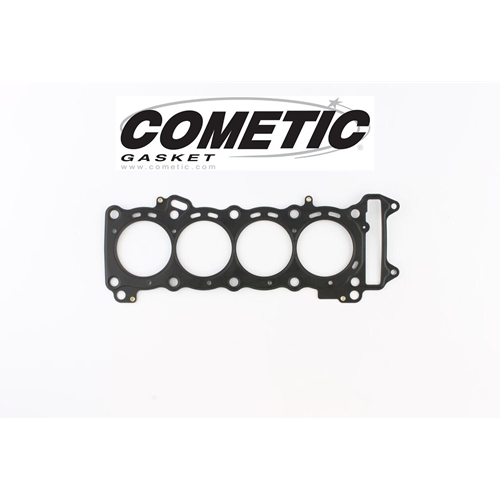 Cometic Gasket - Head Gasket- Suzuki GSXR600 2006 2018 67mm Bore 600cc 0.018" MLS C.O.T. Provides maximum sealing performance for today’s high output engines and require no sealants. MLS gaskets are ideal for both aluminum heads to aluminum blocks and aluminum heads to cast iron blocks. They can withstand the shearing force created by the two materials. MLS gaskets have increased strength because they are comprised of multiple layers of stainless steel; which also creates the ability to rebound and resist corrosion. The outer layers are embossed and coated on both sides with Viton (a flouro-elastomer rubber based material that is heat resistant to 250 C/ 482 F. Viton is designed to meet the demands of a variety of harsh sealing environments, load conditions, and surface finishes. The center or shim layer is uncoated stainless steel, which can be varied to accommodate multiple thickness requirements. Cometic manufactures powersports gaskets utilizing a comprehensive range of materials for reliable sealing under the most extreme conditions. We stock a wide range for ROAD and OFFROAD applications -- head gaskets, base gaskets in varying thicknesses and engine case gasket sets ready for same day shipping. Whether the situation calls for the latest in advanced technology like the MLS (Multi-Layer Steel) gasket, or a synthetic blend such as Aramid Fiber, Cometic has a solution. We especially like the reuseable AFM engine case gaskets.